A two-variable linear programming has a linear function f(x,y) in two variables, called objective function, along with systems of linear inequalities called constraints which defines the feasible solution set as defined in systems of inequalities with two variables. Linear programming is one of the methods of optimization where there is a need to find values of some variables x, y so that function f of the variables x, y has a maximum or minimum value depending on the application to solve. Possible applications of linear programming may be found in engineering, agriculture, medicine, finance, economics, etc. The solution of a linear programming problem, it it exists, must occur at a vertex of the feasible set associated with the constraints of the problem. 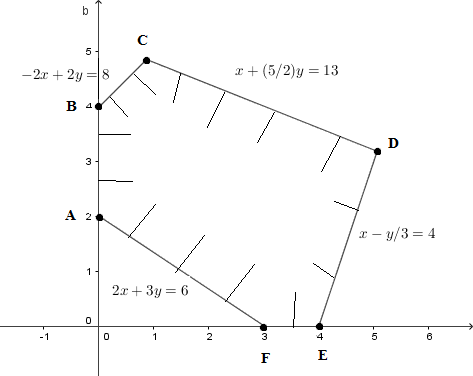 If the solution associated with the constraints and the objective function occur at two adjacent vertices, then all points on the line segment joining these two vertices are solutions. 1) If A is bounded, then f(x,y) has both a maximum and a minimum at the vertices of A. 2) If x ≥ 0 and y ≥ 0 and if A in unbounded, and both a and b are positive, then f(x,y) has a minimum at one (or more) of the vertices of A. Examples with detailed solutions and explanations are presented. The solution set of the system of inequalities given above and the vertices of the feasible set obtained has already been found in Example 3 of "solving systems of inequalities in two variables". The solution set is shown in the figure below. We now evaluate function z(x , y) = 2 x + 4 y at all 5 vertices of the feasible set. at A: the x and y coordinates of A are x = 0 and y = 0.
at B: the x and y coordinates of B are x = 0 and y = 1.
at C: the x and y coordinates of C are x = 6/5 and y = 11/5. 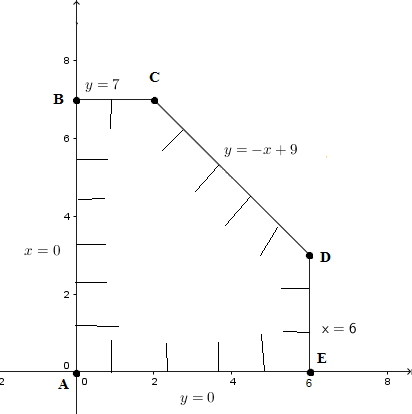 at D: the x and y coordinates of D are x = 22/5 and y = 7/5. at E: the x and y coordinates of D are x = 3 and y = 0. The feasible set to the systems of inequalities is shown below. A vertex is determined by solving the system of equations corresponding to the equations of the lines whose intersection is the vertex to be found. Function z = 4 x + 7y has a minimum value of 12 and occurs for x = 3 and y = 0 (vertex F). The feasible set to the systems of inequalities given above is shown below. 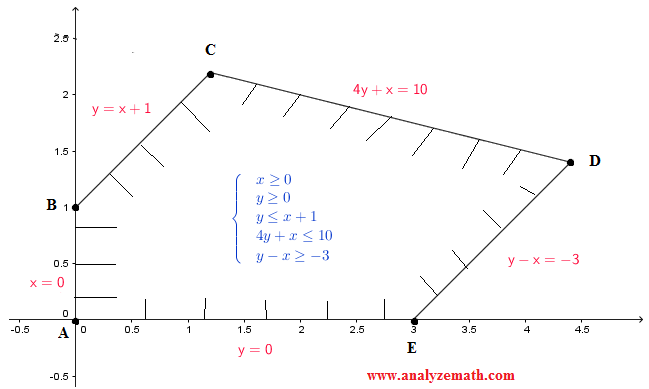 Function z = 3 x + 3 y has a maximum value at two vertices: C and D. In fact all points between C and D on the line y = - x + 9 gives z = 27.
z = 3 (9) = 27 and is maximum for all point on the line y = - x + 9.